This baby powder self tan mousse provides the skin with an instantly bronzed finish that gives the appearance of health and radiance effortlessly. This baby powder self tan mousse provides the skin with an instantly bronzed finish that gives the appearance of health and radiance effortlessly. Infused with super nourishing Vitamin E and Vitamin A, this self tanning solution not only imparts a divinely streak-free bronzed hue to the skin, but also cares, conditions and refreshes the skin featuring the delicately sweet and clean scent of baby powder. 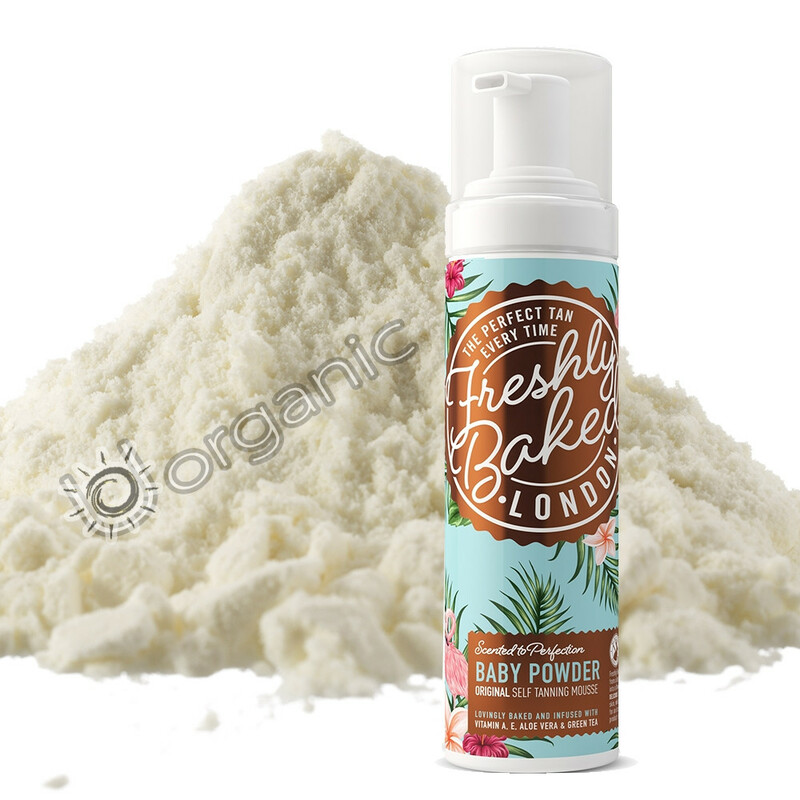 Baby powder self tan mousse is a paraben and alcohol free formula and is ensured to add a golden hue to the skin without appearing unnatural. With the inclusion of Aloe Vera and Green Tea Extracts, this effective product provides a flawless tan with a sumptuous scent, whilst simultaneously soothing and rejuvenating the skin, securing an impeccable finish. Free from Parabens and Alcohol, 100% Cruelty-free and made in the UK. Ingredients: Aqua, Dihydroxyacetone, Erythrulose, Mono Propylene Glycol, Glycerin, Ethoxydiglycol, Aloe barbendensis (Aloe vera), Sodium C14-16 Olefin Sulfonate, DMDM Hydantoin, Tocopherol (Vitamin E), Retinyl Palmitate (Vitamin A), Ubiquinone( CQ10), Camellia Sinensis (Green Tea extract), CI 16035,CI 19140, CI42090 Butylphenyl methylpropional, Citral, Citronellol, Coumarin, Geraniol, Limonene, Linalool.